Everyone says leave the top open but I heard from someone in person that owns a drifting shop that the top should have a fitting be hooked vacuum. That way boost pressure being above 30psi pushes it down and then at 40psi MBC over takes it. Doesn't sound right.. I'd need the top line to have an MBC as well but set to open around 30-35psi. I think I have either an 8 or 14psi spring and I've read and heard they can handle double that when an MBC is used but that doesn't make any sense to me. Thoughts? There are several different ways to connect an external wastegate. The ideal way for your car depends on your goals and equipment. Using both ports is often recommended for better control and other benefits. These "dual port" connections are more often used when incorporating an electronic boost controller. The simplest way is to run in "single port mode" like you are currently doing. PROS: Simple to connect. Very fail-safe (most any failure will result in minimum boost). CONS: Possibility for softer boost onset. Increased wear on diaphragm. Only good for about double spring pressure. An alternate way is "dual port mode" with a MBC. In this mode you apply full pressure to the bottom (side) port, and apply control pressure to the top port from an MBC or electronic control solenoid. The advantages here are not huge. At max boost request, you apply full pressure to the top port. At the same time, full pressure is already on the bottom port. So the forces cancel and resulting force is just the spring holding the gate closed. This is exactly the same as the single port mode. So it is still only good for about double the spring pressure before your exhaust pressure is high enough to blow the gate open. Pros: Possibility for quicker boost onset. Decreased wear on diaphragm. Cons: More things to connect. May not work well with all MBC types. For the best flexibility and range of boost control, you really want a setup that can utilize both ports to their full extent. This means a minimum boost setting where pressure is applied only to the bottom port, and a maximum boost setting where pressure is applied only to the top port. 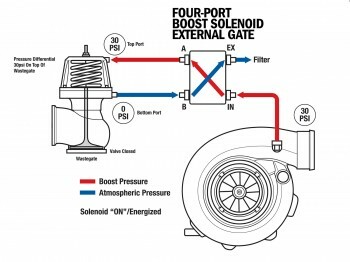 In this way you can run up to 4 times the spring pressure (ie: run 40 psi of boost on a 10psi spring) without having trouble with exhaust pressure blowing the gate open. This nifty setup requires an electronic boost controller with a 4 port solenoid. The long and short of it is that using your existing MBC with a different connection method is not going to drastically change the amount of boost you can run above your spring pressure. You might gain a little bit better control and possibly a slightly quicker spool. To make a drastic change you will need different control hardware or a heavier wastegate spring. **Note: The above is not expert information. I do not have experience with an external gate at the pressures you are running. Please defer to members who are more experienced in this area. Last edited by walky_talky20; 12-31-2018 at 09:47 AM. That's great info. I appreciate it! Very detailed and covers all the possibilities. I was worried someone might say something along about an electronic boost controller. $$$ I'll have to keep researching and maybe come across a home depot ball and spring kind of option. Not a 200$ ecs deal. Truthfully I think I have an 8lb spring. There's a store in Spokane that sells that kinda stuff know so I could get a 20lb spring if they exist /have them.. 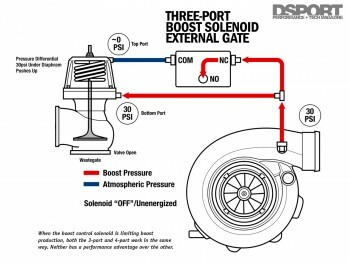 I am curious why you think it would cause softer boost onset as the valve should be fully closed until double spring pressure and it's action or inaction should be completely shut out of the system. With equal forces on both sides. Seeing absolutely nothing from my ball and spring mbc until zyx. No matter what it seems like I need a heavier spring whether I use one port or both. Last edited by vrmm; 12-31-2018 at 11:47 AM. With a ball-spring type, it probably would not cause a difference in onset. That difference comes in when you are applying some pressure to the "wrong" side of the diaphragm (like a bleed-type MBC would apply in single port mode). This obviously works against your spring. You also have exhaust pressure pushing against the gate at the same time. Together the possible result is the gate being pushed open, extending the time it takes to get to your desired boost pressure. The exhaust pressure cannot be underestimated - it is the enemy here. Exhaust manifold pressure can easily exceed the boost pressure in the intake manifold.